Pain that occurs in the course of the sciatic nerve (from the sacrum to below the knee through the back of the leg). It is due to mechanical pressure or nerve inflammation. Conflict of impotence and devaluation of the direction. Anxiety related to a displacement or movement that hinders or forces us. Conflict over having to bow before a person or situation. Fear of the future and lack of material goods, insecurity before everything yet to come. Resentment, repressed anger, rejection to something or someone. The function of sciatic nerve inflammation is to prevent relative information from advancing freely reaching its destination (leg muscles). To avoid taking the step, to walk or to go to someone. 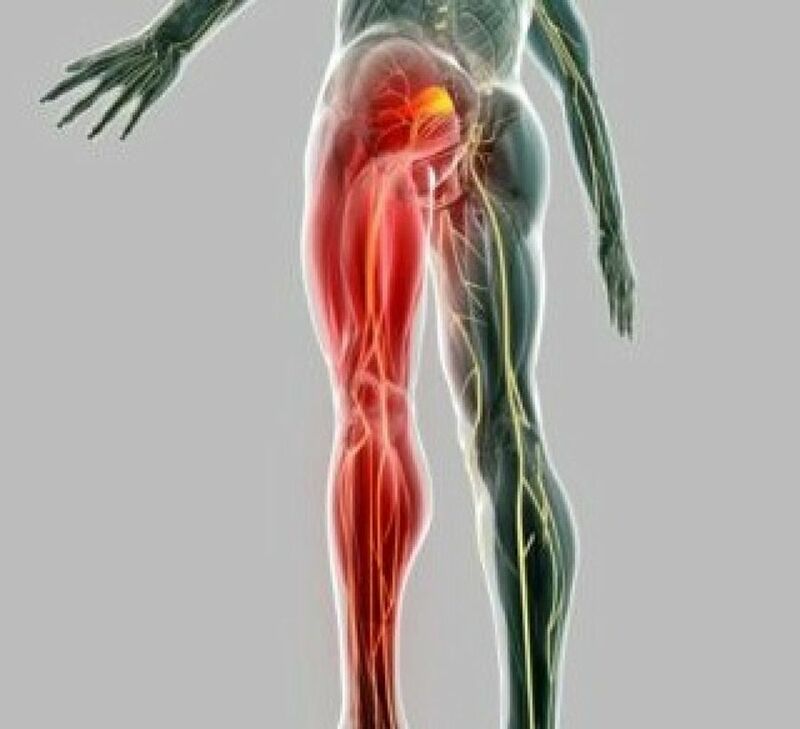 Sciatica pain expresses anger, grief, sadness and a sense of loss. You can make different interpretations depending on the area of the ​​nerve where the pain is more intense, for example, if the pain is stronger in the buttock (body part that symbolizes power, feel well "settled") we express the pain and the fear we lose our power (money, prestige, position, etc.) and stop feeling like a valuable person. If the pain is more intense in the thigh (support for projects) or leg (forward, go towards others) it tells us that we are afraid to deal with a situation that highlights our insecurity, (separation, loss work, money, etc.). As the leg speaks of relationship, an inflammation of the sciatic nerve in it, it may be because we have felt betrayed or abandoned by family or friends, in which we relied, or may express some form of guilt for having behaved hypocrite with someone in our immediate environment way. When the sciatic nerve is inflamed it may indicate that we are afraid to make a change. We have become accustomed to our old beliefs or habits, a certain way of living, which brings us some stability and we are not willing to leave. It can also get worse when we feel anger toward someone who is humble and do not want to submit. Rather, we would like to give him/her a good kick, but we repress our aggression and it just stays in intention. Similarly, we can suffer from sciatica, those who support excessive responsibilities, accepting any order and are unable to say "no", for fear that they do not want. Most of the time, are individuals with lack of self-confidence. Sciatica can also be manifested by a conflict related to sexuality. If it affects the right buttock is rather an affective conflict. If, however, the origin is in the left buttock, it refers to professional or economic conflict. Finally, the most pains from sciatica indicate a conflict of fear of the future related to lack of money, fear of not having enough financial means to pay for our house, our food, in other words, to live quietly. Most people with sciatica often appear to be abundant and prosperous, secure their income, but at the moment of truth, they feel a deep fear of not having resources, money, that is, to stay poor. As a result they generate resentment, aggression and rejection towards themselves and towards others. Right leg: "Fear of not having money to cope with the financial needs" "I'm spending a lot of my savings". It is a "disgruntled" emotion. On the one hand we buy something we need, but inwardly we object to make that expense. Left leg: "Not being able to give everything in the material plane, to the people we love" "I would like to have more money to support my parents"
"I would like to pay college to my brother or share home with my sister"
It is a "disgruntled" emotion. On the one hand, we would like to spend on something that needs a loved one, but at the same time something inside us tells us not to do, for fear that we run out of money. If sciatica is related to the vertebrae L5-S1, it expresses that we are living in a conflict related to our collaterals (siblings, cousins, friends, co-workers) coupled with a topic related to "the sacred" (conception, birth, death, parenthood, grandparent). "I must pay the funeral of my grandfather"
"I pay my grandson's christening"
When sciatica affects the lumbar vertebrae L4 and L5, it expresses conflicts by rules (the "right", "normal", "usual"), with our collaterals (siblings, cousins, friends, co-workers). Awareness of attachment to material goods without feeling guilty. It is something human. When we trust in our ability to meet our needs, material attachment disappears. "I am a rich and prosperous person. I rely on the abundance of the Universe"
"I need to understand that the more I give, the more I receive"
"I feel secure and safe"
Realize the overload situation to compensate for their lack of confidence and security and not to fall into it. Make a refocusing, a change, and move inside. Transmute humiliation humility and try to be honest with oneself and with others.